Higher CO2 levels are beneficial for many crops. In species with a 'C3' photosynthetic pathway, like rice and wheat, higher CO2 directly stimulates photosynthetic rates, but this mechanism does not affect C4 crops like maize. Higher CO2 allows leaf pores, called stomata, to shrink, which results in reduced water stress for all crops. 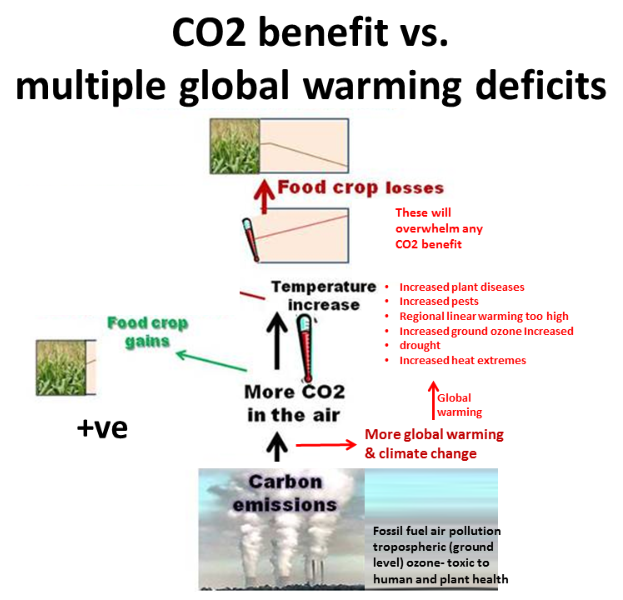 Another problem with the assumed benefit is that the research that projects a CO2 fertilization benefit is for a doubling of atmospheric CO2 (550 ppm) which we now know would catastrophic to humanity and the planet, and would result in the temperature increases that would be devastating to most crops in most regions as pointed out by the FAO in a 2011 report on agriculture and climate change. The net effect on yields for C3 crops has been measured as an average increase of 14% for 580 ppm ppm (Ainsworth et al., 2008). For C4 species such as maize and sorghum, very few experiments have been conducted but the observed effect is much smaller and often statistically insignificant (Leakey, 2009). Results of experimental studies indicate that many crop plants, including wheat and soy, respond to elevated CO2 with increased growth, although not uniformly so. On the other hand, newer field studies carried out in ““free air CO2 enrichment”” (FACE) environments showed that the growth response of some crop types was significantly (50%) smaller than expected (e.g., Long et al., 2006). The response of crop plants to carbon fertilization in the field remains an issue of some debate. Here is what the NRC says in the 2010 Climate Stabilization Targets. For C3 crops, the negative effects of warming are often balanced by positive CO2 effects up to 2-3 °C local warming in temperate regions, after which negative warming effects dominate. Because temperate land areas will warm faster than the global average, this corresponds to roughly 1.25-2 °C in global average temperature. 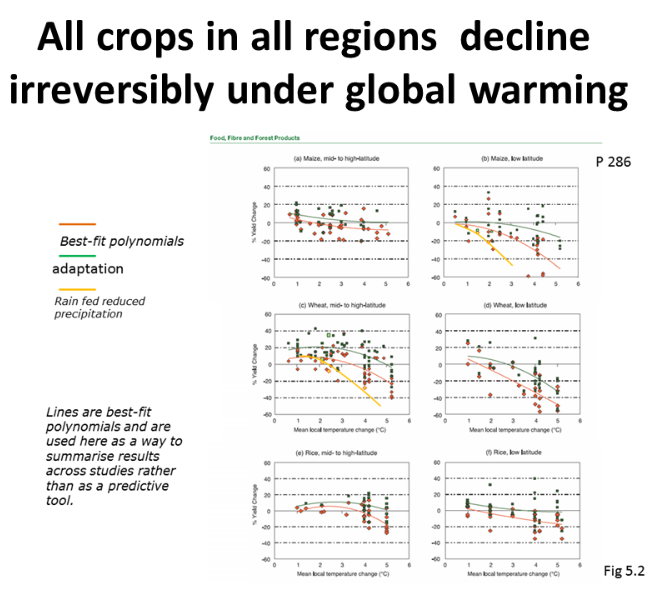 For C4 crops, even modest amounts of warming are detrimental in major growing regions given the small response to CO2. ​C4 crops are essential to world food security as they include maize, millet, sourgum, sugar cane and many pasture grasses. The IPCC assessment says that any CO2 fertilization effect for the lower latitudes will have a negligible impact and so crop yields will decline with a very small temperature increases. For the mid and the high latitudes the IPCC chooses its language carefully saying that the CO2 fertilization effect may result in a small increase in crop yields for a while initially as temperature increases, after which crop yields will decline. The US federal climate change assessment does not foresee CO2 benefit for American crops past 2050, ​​when crop yields are predicted to decline. Carbon dioxide unlike the other global warming greenhouse gases has a potentially beneficial effect for plant growth. 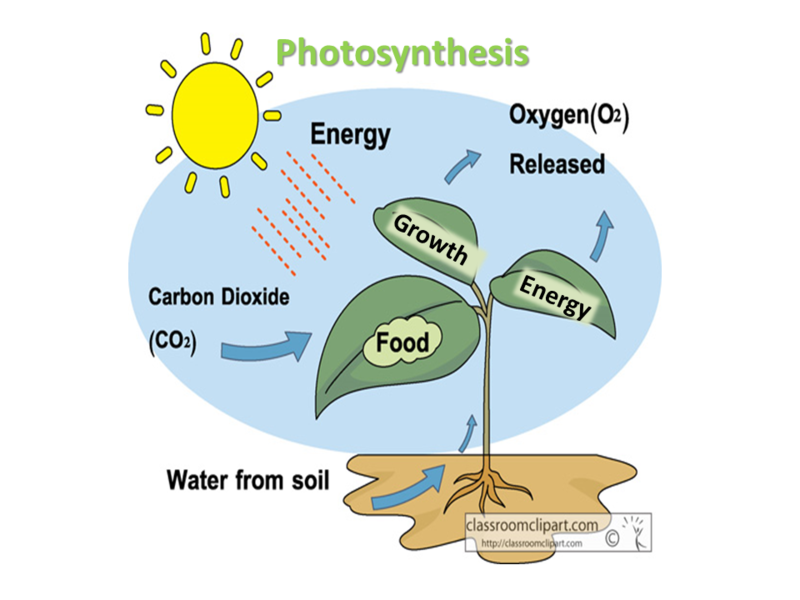 Plants utilize the carbon dioxide in the air together with sunlight to manufacture carbohydrate for their energy and growth. Potentially, there is a so-called carbon dioxide 'fertilization' effect of increasing the ambient carbon dioxide. ​However the potential CO2 benefit only applies to some crops. It does not apply to maize - one of the worlds top food resources- nor to millet, sourgum, sugar cane and many pasture grasses. The climate assessments say (i.e. assume) that this CO2 benefit will happen under global and climate change. How ever research over the past few years shows that this enhanced growth lowers nutritional value of crops, making it no real benefit. Emissions have elevated atmospheric CO2 to its highest in 15 million year, so one would expect to see evidence of strong CO2 fertilization effect by now on crops. In fact the indication from a 2012 study on patterns of crop yields is that crop yields that have been steadily increasing could be stagnating. Under a situation of uncontrolled greenhouse gas pollution and global warming, which is our current situation, any beneficial effect from carbon dioxide fertilization will at best be small and short lived, as the IPCC says. A regional climate change model (PRECIS) for China, developed by the UK's Hadley Centre, was used to simulate China's climate and to develop climate change scenarios for the country. Regional crop models were driven by PRECIS output to predict changes in yields of key Chinese food crops: rice, maize and wheat. Modelling suggests that climate change without carbon dioxide (CO2) fertilization could reduce the rice, maize and wheat yields by up to 37% in the next 20–80 years [i.e. 3C]. ... CO2 enrichment under field conditions consistently increases biomass and yields in the range of 5–15%, with CO2 concentration elevated to 550ppm Levels of CO2 that are elevated to more than 450ppm will probably cause some deleterious effects in grain quality. It seems likely that the extent of the CO2 fertilization effect will depend upon other factors such as optimum breeding, irrigation and nutrient applications. Lin Erda, et al Philos Trans R Soc Lond B Biol Sci. 2005 November 29; 360(1463): 2149–2154. 2005 October 24. Several reviews (e.g. 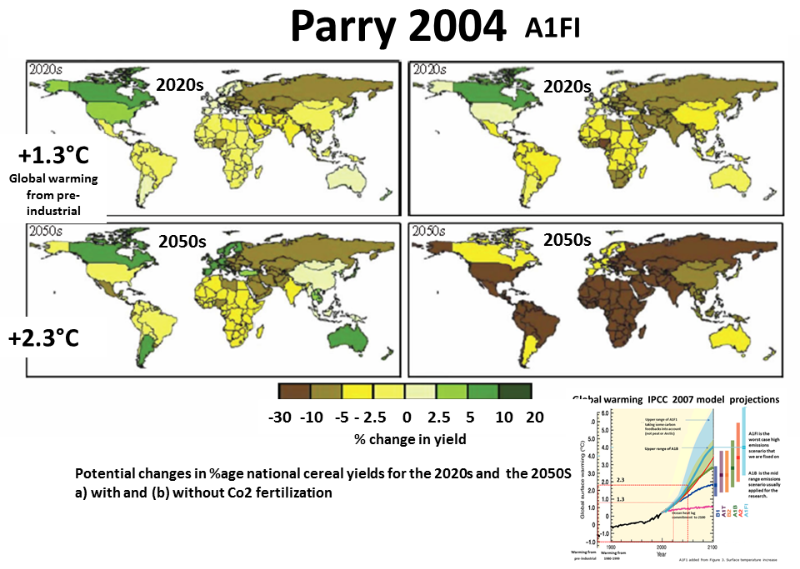 Amthor 2001; Fuhrer 2003) have assessed the potential consequences of changes in climate on the growth and yield of crop plants, concluding that the earlier-anticipated benefits of CO2 fertilization would be largely offset by nutrient limitations, pollutants and further interactions with climatic factors (see also Long et al. 2005). Similarly, simulations of maize production in Africa and Latin America using climate data from the HadCM2 model to generate characteristic daily weather data for 2055 predicted an overall reduction of 10% (Jones & Thornton 2003). from Climate change and food security P.J Gregory 2005. ​​Up to the 2007 assessment, the IPCC assessment is assumed then due to a potential benefit to the temperate regions of increased ambient CO2 up to 2100 at least crops in these regions would not suffer from climate change and could even benefit. The 2007 IPCC assessment concluded that this was by no means certain and at best it would be modest and brief. ​Most crop models have been based on hundreds of experiments in greenhouses and field-chambers dating back decades, which suggest that crop yields will increase by 20 – 30% at 550 ppm carbon dioxide. Even maize, which uses a different system for photosynthesis and does not respond to the direct effects of carbon dioxide, shows increases of 18 – 25% in greenhouse conditions due to improved efficiency of water use. ​​But new analysis by Long et al. (2006) showed that the high-end estimates were largely based on studies of crops grown in greenhouses or field chambers, whereas analysis of studies of crops grown in near-field conditions suggest that the benefits of carbon dioxide may be significantly less – an 8 – 15% increase in yield for a doubling of carbon dioxide for responsive species (wheat, rice, soybean) and no significant increase for non-responsive species (maize, sorghum). These new findings may have very significant consequences for current predictions about impacts of climate change on agriculture. ​​Parry et al. 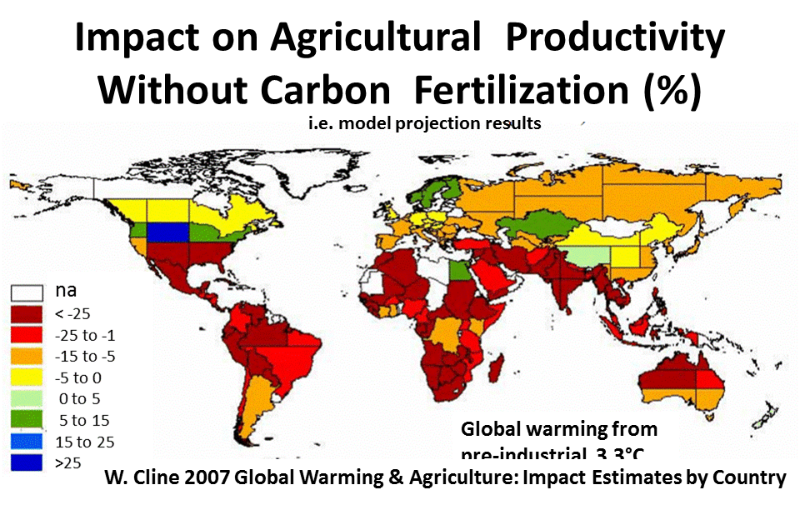 (2004) examined the impacts of increasing global temperatures on cereal production and found that significant global declines in productivity could occur if the carbon fertilisation is small (figures below). The most vulnerable part of a plant's life cycle is the polli¬nation period. ​​Of the world's three food staples-rice, wheat, and corn-corn is particularly vulnerable. In order for corn to reproduce, pollen must fall from the tassel to the strands of silk that emerge from the end of each ear of corn. Each of these silk strands is attached to a kernel site on the cob. If the kernel is to develop, a grain of pollen must fall on the silk strand and then journey to the kernel site. When temperatures are uncommonly high, the silk strands quickly dry out and turn brown, unable to play their role in the fertilization process. The effects of temperature on rice pollination have been studied in detail in the Philippines. Scientists there report that the pollination of rice falls from 100 percent at 34 degrees Celsius to near zero at 40 degrees Celsius, leading to crop failure. Is global warming fueling a new generation of more aggressive weeds? According to recent research, the answer may be yes. One of the major characteristics of a warming planet is an increase in the amount of carbon dioxide in the atmosphere. Rising carbon dioxide has been shown to help vegetable and grain crops grow more quickly, become more drought-resistant and produce potentially higher yields. ​​Unfortunately, though, the impact of rising carbon dioxide seems to be far more pronounced in the weeds that compete with crops than in the crops themselves. “Weeds are survivors,” said Lee Van Wychen, director of science policy for the Weed Science Society of America. “They can fill various niches and thrive under a wide range of conditions. ​​While we have about 45 major crops in the U.S., there are more than 400 species of different weeds associated with those crops. There is always another weed species ready to become a major competitor with a crop if growing conditions change, such as an increase in carbon dioxide levels. ​​” The impact of rising carbon dioxide levels on weeds can be striking. In a study conducted by Dr. Lewis Ziska of the U.S. Department of Agriculture’s Agricultural Research Service, weeds grown under urban conditions of warmer temperatures and more carbon dioxide – conditions anticipated for the rest of the world in 50 years – grew to four times the height of those in a country plot 40 miles outside the city, where carbon dioxide and temperature reflected background conditions. Theoretical estimates suggest that increasing atmospheric CO2 concentrations to 550 ppm, could increase photosynthesis in such C3 crops by nearly 40 per cent (Long et al. 2004). ​​Experiments under idealized conditions show that a doubling of atmospheric CO2 concentration increases photosynthesis by 30–50% in C3 plant species and 10–25% in C4 species (Ainsworth & Long 2005). Crop yield increase is lower than the photosynthetic response; increases of atmospheric CO2 to 550 ppm would on average increase C3 crop yields by 10–20% and C4 crop yields by 0–10% (Gifford 2004; Long et al. 2004; Ainsworth & Long 2005). Some authors argue that crop response to elevated CO2 may be lower than previously thought, with consequences for crop modelling and projections of food supply (Long et al. 2004, 2009). Plant physiologists and modellers alike recognize that the effects of elevated CO2, as measured in experimental settings and subsequently implemented in models, may overestimate actual field and farm level responses. This is because of many limiting factors such as pests and weeds, nutrients, competition for resources, soil water and air quality which are neither well understood at large scales, nor well implemented in leading models. ​Despite the potential positive effects on yield quantities, elevated CO2 may, however, be detrimental to yield quality of certain crops. For example, elevated CO2 is detrimental to wheat flour quality through reductions in protein content (Sinclair et al. 2000).